SURETEST is a pen-shaped pregnancy test that allows the detection in 5 minutes of the hormone chorionic gonadotropin HCG in the urine of the pregnant woman. Simple, fast, single use. A urine pregnancy test specifically designed for self-diagnosis. Simple, reliable and fast pregnancy test . Suretest Bt / 1 Cooper Pregnancy Test is a simple and effective way to find out if you are pregnant from the first days of late menstruation. This pregnancy test detects the presence of the hormone HCG in the urine to diagnose a possible pregnancy. In fact, the Gonadotropic Chorionic Hormone is secreted by the placenta when the embryo attaches to the uterine wall at the time of implantation. If fertilization has occurred, the level of HCG increases in the blood from the 10th day and it increases again, after this time. The Suretest has been designed to deliver a fast response , in just five minutes and allows a clear reading of the result . On the one hand, in favor of women eager and impatient to live the adventure, on the other hand, to all those who, at a given moment and because of an abnormal delay of menstruation , are likely to question. Take the test preferably on waking and fasting. Hold the stem under a stream of urine for at least 3 seconds, then replace the cap. 1 purple band in control zone C: negative test. 2 purple bands one in the control zone C, one in the result zone (T): positive test. Usable from the day of the rules and at any time of the day. Comment on the recommendations for use and dosage of Suretest Bt / 1 COOPER Pregnancy Test with our Verified Reviews partner after your purchase. Equipped with an absorbent rod and a window with 2 reading zones, a result zone (T: test), a control zone (C). Sensitivity 25 IU / l.
Store preferably between 4 ° C and 25 ° C.
A box containing a pregnancy test pen. 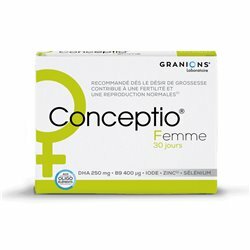 To improve your chances of conception, we advise the taking of PILEJE FEMINABIANE DESIGN and PREGNANCY or CONCEPTIO WOMAN ENHANCED FERTILITY to get pregnant naturally and more easily. When a doubt about male fertility is involved, we recommend that you take CONCEPTIO HOMME or ANDROBIANE CONCEPTION PILEJE to promote and strengthen your chances of conceiving a child. Conceptio will act on the production, the quality and the mobility of the spermatozoa thanks to the action of an exclusive complex and patented by the laboratory EA PHARMA - GRANIONs.